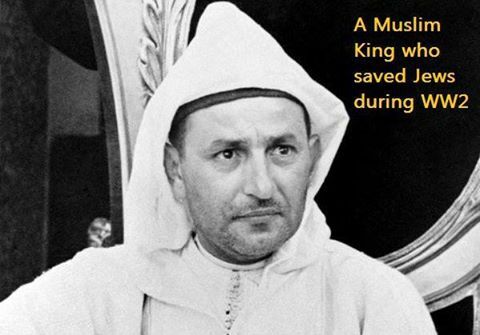 King Mohammed was determined to preserve Morocco's ancient Jewish community, and he extended his unwavering protection for three long years of Nazi occupation. Born in 1909, Mohammed ascended to the throne as Sultan in 1927, when he was only 18 years old. Morocco was a French protectorate, so when Germany invaded France in 1940 and installed a collaborationist regime, the North African nation also fell under Nazi rule. The Nazi regime immediately tried to pass laws in Morocco to ban Jews from various professions, expel them from the best schools, and create a ghetto. The young king (32 years old) blocked all anti-Jewish legislation. He refused to identify the nation’s Jews. “There are no Jews in Morocco,” he said, “only subjects." He stood firm against ghettoizing and deporting Moroccan Jews despite constant pressure from the Vichy authorities. In a proud show of defiance, the king invited all the rabbis of Morocco to attend the royal throne celebration in 1941. In 1948, King Mohammed became troubled by anti-Jewish incitement in the Arab world against the new state of Israel. He issued a stern warning to his subjects not to hurt Jews, reminding them that Jews had always been protected in Morocco. Mohammed V died in 1961, at age 51. For his strong stance against Nazi persecution, he was honored posthumously by the Institute for World Jewish Studies with the Reverend King /Rabbi Heschel Award. "We are living at a time and in a world in which the collective imagination of our societies is too often impaired, not to say poisoned, by regression and archaism. By capitalizing on the depth and resilience of the legacy left by my revered grandfather His Majesty Mohammed V, we can, together, set out to recover the lost expanses of reason and mutual respect which have vanished from many parts of the world.